Add one of these 8 differnt styles of 100% cotton golf towels to your golfing kit. 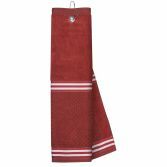 Our golf towels have a soft plush velour waffle pattern on one side and terry on the back. Perfect for wiping your hands, golf balls or clubs, our tri fold golf towels include a centered grommet and bag hook allowing you to hang your towel from your golf bag, belt or pant belt loop. These golf towels compliment our knitted golf club headcovers. There are also matching putter covers available. Our black and pink golf towels come with polka dot ribbon accents. The red, lime green, turquois, navy, orange and purple towels have striped ribbon accents. w/ black/white polka dot accents. w/ pink/white polka dot accents. 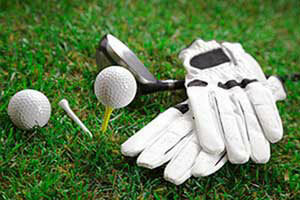 Our 100% cotton golf towels are shipped from the U.S.A. and are available for shipment to Canada and U.S.A. via U.S. Postal Service. These colorfull golf towels match our knitted golf club headcovers. Check out them out! Order Your Golf Towel Now!